Before Johnny 'J.R' Cash walked into Folsom State Prison, California on January 13th 1968 he'd been a steady visitor to the country charts with hits such as I Walk The Line and Ring Of Fire. But running parallel to Cash's success had been the escalating battle with demons: riding a rollercoaster of alcohol and drug fuelled mayhem, almost to its conclusion. This live album changed all of that. The redemption he found came from the love of a good woman (June Carter, the co-author of Ring Of Fire; the woman whose family also helped him overcome his addictions,) and in the shape of Bob Johnston, the new head of production at Columbia records. Cash had been playing prisons, along with the aforementioned Carter Family since the early 60s but these were considered risky events, not fit for public consumption. Cash knew that his empathy with incarcerated men drove him to performance levels that couldn't be matched by studio work. The new producer ok'ed the project and, backed by his Tennessee Three, June (now soon to be his wife), The Statler Brothers and Carl Perkins, he prepared for two shows. Until now the only evidence of this day was mainly drawn from the first set where Cash - who by this time had garnered a reputation for diffident shows and even non-appearances - was on incredible form. This set (recorded at 9.40 in the morning!) of course had to include his 1955 hit, Folsom Prison Blues (the one where he shoots a man in Reno "just to watch him die"). You can imagine the reception. Cash was determined to stand face to face with the gravity of the situation (he'd never served time, incidentally, but had seen the inside of jail cell). He played songs that dwell on darkness (Dark As A Dungeon) and the pathos of a life spent behind bars (Green Green Grass Of Home). But on this expanded edition we can hear the profanities he trades with the prisoners while ever-mindful to inject fun into proceedings with Egg Sucking Dog, Flushed From The Bathroom Of Your Heart, his duet of Jackson with June or the literal gallows humour of 25 Minutes To Go. Capping the performance is Greystone Chapel, rehearsed only the day before. It was written by Glen Sherley (a key figure in Cash's fight for prison reform), who was doing time in Folsom for armed robbery. 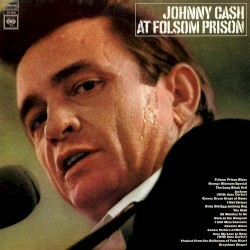 On its release, At Folsom Prison was lauded by critics who reached far beyond the country mainstream. He now spoke to a generation who now wanted more than just pop, seeing him as a true people's champion. These raw, honest performances made him a legend and this legacy edition (which includes both a DVD and the entire, somewhat exhausted, second performance) can only add to that.